3-Ernest William Walker was born on 15 Jan 1874 in Westbury, Tasmania and died on 7 Jan 1923 in New Zealand at age 48. Ernest married Rose Emma Featherstone, daughter of Robert Rose and Susan Coates, on 7 May 1902 in Hadspen, Tasmania. Rose was born on 24 Jun 1873 in Launceston and died on 29 Mar 1967 at age 93. William and Jane's first child, Ernest William was born at Westbury on 15th January, 1874. He entered the Presbyterian Ministry and was at one time stationed at Don, travelling by horse or on foot to churches as far afield as Spalford near Sprent. He married Rose Featherstone of a well-known Hadspen family on 7th May, 1902. With two children they moved to New Zealand where Ernest held three different Presbyterian Charges before contracting typhoid fever from which he died on 7th January, 1923. Two more children were born to Ern and Rose in New Zealand. It is reported that Reverend Ern Walker was a well accepted minister, loved the country and loved horses, even breaking in one of his own to convey him among his parishioners, ministering to roadside gangs or town folk as the case may be. Maybe Ernest's example led to one of the Goss cousins describing himself as a Presbyterian. From his own remarks as reported by the New Zealand press it appears that he had left Tasmania originally to take up home mission work in Victoria, 16 years prior to his transfer from Ormond, New Zealand, to Bluff, New Zealand, i.e. in 1897 at age of 23. It may be conjectured that he moved to Victoria to undertake training for the ministry, returned to Tasmania for a time, and moved to New Zealand in 1905. He was ordained during the eight years he spent at Ormond, then served at Bluff for five years, and had completed a further five years at Leeston at the time of his death. The calibre of his ministry may be gauged from the two press articles produced below. THE REV. ERNEST W. WALKER. Our Christchurch correspondent wires that the Rev. 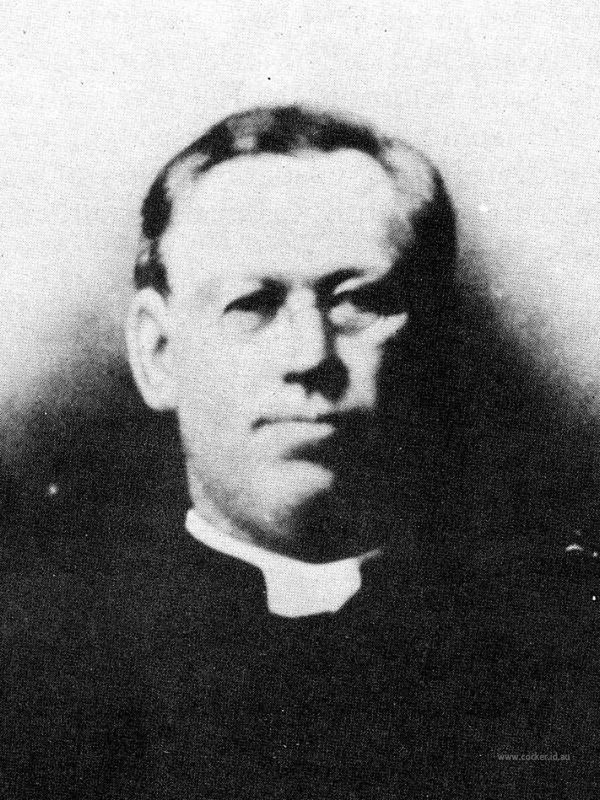 Ernest W. Walker, Presbyterian minister at Leeston, died in the Christchurch Hospital yesterday from typhoid fever; aged forty-eight years. He leaves a widow and four children. He had been at Leeston for five years. Eighteen years ago he came to New Zealand from Tasmania as a home missionary, and went to Ormond, in the Poverty Bay district. While there he was ordained, and received a call to Bluff, where he remained five years. The deceased took an active interest in affairs outside the church, and was a member of the Bluff Borough Council. He was a staunch worker in the Prohibition campaign. This cutting was found in an old cabinet belonging to Henry Thomas and Christina Walker. Christina was born in New Zealand, a few weeks after her parents' arrival from Scotland. Her maiden name was also Walker. 4-Irene Nellie Walker was born on 13 Aug 1903 in Don, Tasmania and died on 21 Aug 1990 at age 87. 4-Doris May Walker was born on 5 Apr 1905 in Don, Tasmania and died on 3 Aug 1968 at age 63. 4-Ernest William Walker was born on 10 Mar 1911 in New Zealand and died on 4 Apr 1984 at age 73. Ernest married Joan Kirby. Joan was born on 16 Feb 1916. They had four children: Helen, John William, Janette Marion and Beverley Anne. 5-Helen Walker was born on 16 Jan 1949. Helen married Neil Mathews. Neil was born on 12 Sep 1942. They had three children: Brent David, Craig William and Vanessa Louise. 6-Brent David Mathews was born on 28 Mar 1969. Brent married Donna Rae Curran. Donna was born on 22 Jul 1970. They had two children: Nathan Brent and Jason Kirk. 7-Nathan Brent Mathews was born on 11 Sep 1991. 7-Jason Kirk Mathews was born on 15 Apr 1994. 6-Craig William Mathews was born on 7 Aug 1971. Craig married Tracy Leigh Thompson. Tracy was born on 11 Mar 1971. 6-Vanessa Louise Mathews was born on 24 Sep 1979. 5-John William Walker was born on 21 Jun 1951. John married Julie Lynette Wright. Julie was born on 2 Nov 1953. They had three children: Vicki Julie, Jacqueline Lynette and Louise Nichole. 6-Vicki Julie Walker was born on 20 Oct 1975. 6-Jacqueline Lynette Walker was born on 20 Mar 1979. 6-Louise Nichole Walker was born on 18 Jan 1982. 5-Janette Marion Walker was born on 21 Jun 1951. Janette married Ross Radford. Ross was born on 7 Nov 1948. They had three children: Lynley Jan, Darren and Gavin John. 6-Lynley Jan Radford was born on 3 Jan 1979. 6-Darren Radford was born on 25 Mar 1981. 6-Gavin John Radford was born on 17 Mar 1983 and died on 24 Nov 1983. 5-Beverley Anne Walker was born on 23 May 1958. Beverley married Ray Brezelen Morgan. Ray was born on 10 Jan 1955. They had four children: Kane Hemi, Joel Rangi, Amy Lee and James Rangi. 6-Kane Hemi Morgan was born on 11 Feb 1981. 6-Joel Rangi Morgan was born on 27 May 1985 and died on 19 Jul 1986 at age 1. 6-Amy Lee Morgan was born on 29 Apr 1987. 6-James Rangi Morgan was born on 5 Sep 1988. 4-Jean Moffat Walker was christened on 2 Nov 1913 in New Zealand and died on 1 Apr 1980 at age 66.